Deck the halls with...Wait, I have no halls. 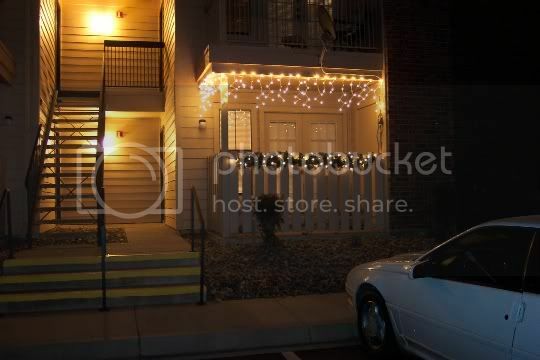 So, tonight I finaly got around to getting the lights up on the outside of my apartment. Last year, all I did was put up some ice icicle on my patio. Well, this year, I wanted to do a little more, so I was also going to put lights around my fence goes around my patio. Well, when I got the lights up on the fence, it looked werid. So, a trip to target and 20 dollars later, I was wraping 20ft of garland around the fence. Then I took the lights, and wraped that around the garland. I am pretty happy with the outcome. I still might get more garland, but I am not sure yet. I will figure that out in a few days. I love what you have done with your outside Christmas decoratons. Looks beautiful and "very well done". You should be proud!! You make me feel ashamed, been meaning to get my outside lights up and still haven't. Will do so this weekend for sure.